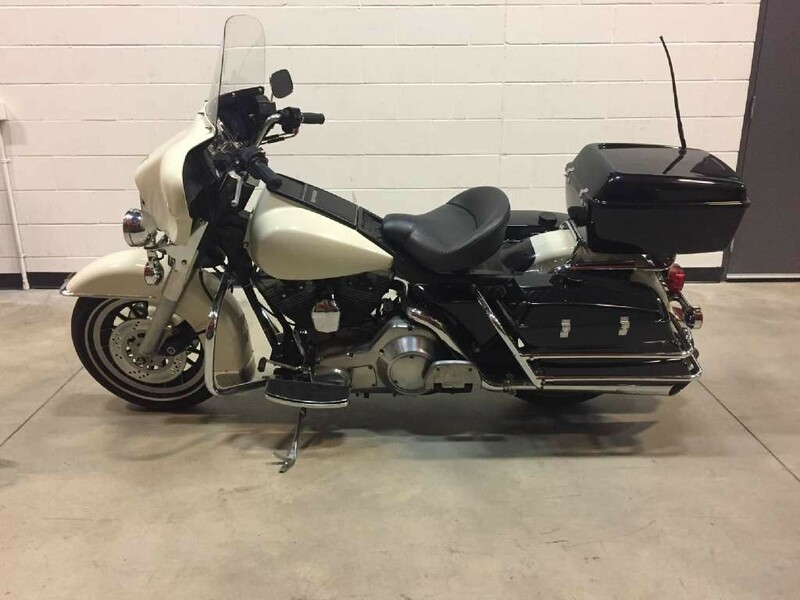 I had been searching for a police Harley for a few years and almost pulled the trigger on a couple. There was a lot of junk out there along with some really pricey stuff. I found a really nice one in Quebec at a Harley dealership, but they wouldn't negotiate that much on the price. With the shipping costs I couldn't justify it. My search continued. I found one in Huntsville Ontario by a private seller, and actually arranged for it to be delivered to me in Brampton. The night before the delivery, I bailed. I regret that decision. My search continued and I eventually found one at Thunder Road Harley in Windsor. It was being sold as unfit and un-plated. I asked bunch of questions and we settled on a price. I was told that it had run at the time it was sold to the dealership, but it needed a battery. I thought that I would get the dealership to install one, so I got a bit of a deal on the price of a new battery and also had them install a connector for a battery tender. I arranged for it to be picked up by Jason, the owner of CTS Transport. I remember the excitment I had the Saturday I arranged for it to be delivered. Jason kept me informed by telling me when he picked it up and all along the way until my bike was delivered. As noted above, Jason basically gave me a play by play regarding the delivery. I waited outside for him to arrive. At some point that Saturday afternoon I saw this huge trailer being hauled down my street. It stopped in front of my house. Jason jumped out and introduced himself. As he started to open the rear of the trailer, he said that he had just delivered a car and that was why the trailer was so big. He said the bike looked great and that it started on the first try when he drove it into the trailer. I don't think I have to tell all of you about the feeling you get when you see your bike for the first time, but it was one of the best feelings I had had in a long time. Jason asked me to sit on it while he helped me back it off of the trailer and down the ramp. Once it was safely on the street, I started it up and rode it into the garage. Boy did it ever seem loud and powerful. I settled up with Jason and he was on his way. Now that I was alone with the bike, I gave it the once over. It seemed to be in decent shape for its age. I notice a few things right away. The red police switches were extremely worn, with most of the lettering gone or almost gone. The seat was in great shape, now rips or tears at all. The paint was in good shape and the tank didn't have any scrapes or dents. My old Honda had a dent from almost new and this paint was actually just as nice. I always liked black but this pearl or birch white looked good. I then checked the oil. I wasn't impressed. It was really dark. I made a mental note to change it before I started it again. I turned it on to check the eelectrics and at first, the turn signals worked briefly but they soon crapped out. In addition, the hazard rocker switch was partially hanging out of the fairing and didn't work. The good news is that the brake light, head light and passing lights worked. The front shocks were leaking from the cracked seals at the top. I decided to take a look underneath the bike. I noticed there was a slight leak from the bottom of the engine were the elbow screwed into the base of the engine. I was hoping that this would be an easy fix, but had no idea at all. There was one other troubling thing. At the bottom of the frame, it appeared that there was some rust and a few holes. When I saw this my heart sank. I asked myself, what the heck I had gotten myself into. To be honest with everyone, I was extremely disappointed. I started to think that if I had possiblly spent more money on a newer bike, I might have been better off. However, I soon reminded myself that this was always going to be a bit of a project bike from the beginning. Once I reminded myself of that, I was excited again. During my next update, I plan to tell you about my search for a mechanic and his first look at the bike. So there I was with a bike that I had planned to do some work on myself. It had been years since I messed around with one. As I looked an my new possession, It dawned on me that my Police bike needed more work and expertise than I had. Luckily, before I purchased it and while I was searching for one, a collegue at the TTC (before I retired), had recommended a mechanic that her and her husband used for their bikes and cars. He was close enough to me as his shop was in Woodbridge. As luck would have it, he also lived near enough to me that he agreed to drop in and look it over. He dropped by one night on his way home and had a good look at it. He said to be honest with you Mike, when you told me you bought a 1986 Harley I was worried. However, he went on to say, It was in pretty good shape overall. He told me he would arrange to pick it up the following Saturday. Most o the things the things he noted could be repaired. His only concern was the frame at the bottom where the engine sat. He wasn't sure that he could have it repaired. So the following Saturday, he showed up with a buddy to pick it up. We wheeled it out of the garage and he started it up. New problem! This time the starter would not disengage. He quickly asked me for my wrench set and remove one of the battery cables from the battery. Problem temporarily solved. That was something I hadn't anticipated or marked down for him. Below is what I thought needed to be brought to his attention, as well as some of the things discussed on his previous visit. Once we got it on the trailer, I handed him the following on a typed piece of paper. I put this list together for us to review. The only actions I took after your visit were to put fuel stabilizer in the gas tank and fill it up. I inflated the tires as you advised me to. When I did the front tire, the brass part of the valve stem started to leak. I took it out and screwed in a new replacement and it now seems fine. I did not replace the rear tire valve stem. As discussed, I put a cotter pin into the bottom of the seat to attach it to adjustable seat air shock/post. However, please check the bottom of the air shock/post (I didn’t get access to it) because it seems a bit loose. 1. I did not get the chance to change the oil (no easy access to drain?) Do you typically clean or replace the Tappet Oil Screen? 2. I did not change transmission oil. 3. As noted when you looked at the bike, it needs repair (welding) on both sides of the frame. 4. It appears that there are some oil leaks that will require new gaskets or a gasket as you noted when you looked at it. 5. It looks like the brass (elbow) fitting the goes into the bottom right near where the oil filter screws in is leaking slightly as well as some of the hoses in the area. 6. You indicated you normally reroute that small chrome breather? That currently has a zip tie on it. 7. Exhaust Pipes. Replace any necessary fasteners or claps. 8. Tune up and adjustments as necessary? I have looked for gas leaks after filling the tank and there does not appear to be any that were visible. Please review Engine for anything we didn’t see/discuss. As I indicated, I had started it to take it off the transport trailer and move it into the garage. Seemed to start and run fine. However, didn’t want to start it again until the oil was clean. You and I discussed the leaks and things that you will look at once the fairing is off. We discussed lowing the bike by 2 inches. As discussed, it has a new battery and has been on a battery tender since I had it. Radio doesn’t appear to be working. All lights appear to be working now except the turn signals. They worked briefly, as discussed. The hazard switch doesn’t seem to stay in its opening, seems that one of the clips on the switch is broken. Obviously all of the above will be looked at once you remove the fairing to access everything. I have been looking for red police switches to replace all of the worn ones but haven’t found any yet. As discussed, please do a review the bike overall, for anything else and let me know for immediate things and then suggested/project things for the fall/winter. In addition to the above, you mentioned that as hose kits are available. You mentioned that you were not sure if it should be done now or could wait in the fall/winter. The final thing will be to have it certified. As discussed, I am not in any rush at all, so it can be done to your schedule as you see fit and your time allows. As we said good bye, I wondered when I would see the bike again. As they left, I watch as my Harley disappeared down the street. The next time, I will talk briefly about my search for parts. Who would have known how difficult it would be to find the things I was looking for or where I would end up finding them. Growing up I had an interest in motorcycles. My first bike was a Honda trail bike. It was street legal and I rode it to and from the trails near my cousin's house off of Islington avenue near Woodbridge. The odd time we use to get chased by the police because I think some of it was private property. Lots of people went there but it seemed they were after the bikes. I next moved up to a Honda CB 750. Too much power for me I think but when you are 17 or 18 you don't care. Then life happened. Sold the bike and got married, had kids and grew up. LOL. However, I always told myself that one day I would get a police bike. Move forward 40 years and here we are. I have included a picture as it looked when I got it. I bought it sight unseen a couple of years ago from a Windsor dealership. Not the wisest thing to do but that's another story.